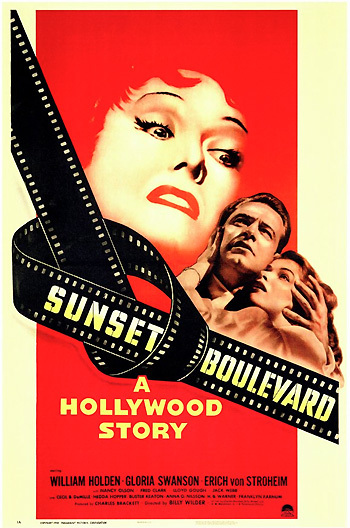 Sunset Boulevard (1950) is a classic black comedy/drama, and perhaps the most acclaimed, but darkest film-noir story about "behind the scenes" Hollywood, self-deceit, spiritual and spatial emptiness, and the price of fame, greed, narcissism, and ambition. The mood of the film is immediately established as decadent and decaying by the posthumous narrator - a dead man floating face-down in a swimming pool in Beverly Hills. With caustic, bitter wit in a story that blends both fact and fiction and dream and reality, co-writer/director Billy Wilder realistically exposes (with numerous in-jokes) the corruptive, devastating influences of the new Hollywood and the studio system by showing the decline of old Hollywood legends many years after the coming of sound. The screenplay was based on the story A Can of Beans by Wilder and Brackett - this was the last collaborative film effort of Brackett and Wilder who had worked together on many films since 1938. This classic, tragic film was highly-regarded at its time, honored with eleven Academy Award nominations and the recipient of three Oscars: Best Story and Screenplay (co-authored by Charles Brackett, D.M. Marshman, Jr., and Billy Wilder), Best Black and White Art Direction/Set Decoration, and Best Scoring of a Dramatic or Comedy Picture (Franz Waxman). The eight unsuccessful nominations were for Best Picture, Best Actor (William Holden), Best Actress (Gloria Swanson, who lost to Judy Holliday for Born Yesterday), Best Supporting Actor (Erich von Stroheim), Best Supporting Actress (Nancy Olson), Best Director, Best B/W Cinematography (John Seitz), and Best Film Editing. The other starring role belonged to a modern day, B-movie hack screenwriter/narrator (William Holden, although Montgomery Clift was once considered for the role) who spoke beyond the grave as a phantom narrator. He recounted how he struggled to produce screenplays to meet the demands of the industry and satisfy the thirsty illusions of immortality of the aging silent film queen in her decaying mansion. After being showered with bribes (clothes, money, flattery and other gifts), he was quickly spoiled and ensnared in her web of delusion - and death trap. Sunset Boulevard was adapted into a musical in mid-1993, with a score by Andrew Lloyd Webber, and first opened in London with Patti LuPone in the lead role. In late 1993, Glenn Close portrayed Norma Desmond in the debut Los Angeles (not Broadway) performance in the US. Close also opened the Broadway production in November, 1994, and the show received seven Tony Awards in 1995 - but its successful run ended in 1997. The film opens with a pan down to a street curb/gutter in Hollywood with dead leaves. The curb is stenciled with SUNSET BLVD. - the image is an appropriate metaphor for the tawdry exposé to follow. The camera pulls back across the cracked, defaced asphalt with superimposed credits - also stenciled. Yes, this is Sunset Boulevard, Los Angeles, California. It's about five o'clock in the morning. That's the Homicide Squad - complete with detectives and newspapermen. A murder has been reported from one of those great big houses in the ten thousand block. You'll read about it in the late editions, I'm sure. You'll get it over your radio and see it on television because an old-time star is involved - one of the biggest. But before you hear it all distorted and blown out of proportion, before those Hollywood columnists get their hands on it, maybe you'd like to hear the facts, the whole truth. If so, you've come to the right party. You see, the body of a young man was found floating in the pool of her mansion - with two shots in his back and one in his stomach. Nobody important, really. Just a movie writer with a couple of 'B' pictures to his credit. The poor dope! He always wanted a pool. Well, in the end, he got himself a pool - only the price turned out to be a little high. The narrator's voice sounds amused - he promises to tell us, in a unique flashback structure, the real story of young screenwriter Joe Gillis (William Holden) and how he ended up face down (with his eyes open) in the villa's pool - his watery grave. [The same flashback plot device, told by a dead man in voice-over, was copied by American Beauty (1999).] As the scene dissolves to an earlier time, the voice explains: "Let's go back about six months and find the day when it all started." Well, I needed about two hundred and ninety dollars and I needed it real quick, or I'd lose my car. It wasn't in Palm Springs and it wasn't in the garage. I was way ahead of the finance company. I knew they'd be coming around and I wasn't taking any chances. With his car keys (with a miniature rabbit's foot attached for luck), Joe ventures out to Paramount Pictures Studios to sell an "original story" - a baseball script titled Bases Loaded to a callous, "big shot" "smart producer" named Sheldrake (Fred Clark). [Not surprisingly, Sheldrake was the name given to another cold-hearted, philandering senior business executive in Wilder's The Apartment (1960).] While Joe describes his idea and promotes Alan Ladd for the lead role, Sheldrake's secretary appears with a glass of milk and a bottle of pills to ease the producer's ulcer. Joe's treatment of the screenplay is criticized by clean-cut, Paramount script reader Betty Schaefer (Nancy Olson) - she denounces it in "a two page synopsis" as being written "from hunger," "a rehash of something that wasn't very good to begin with," and "flat and trite." She is startled to discover that her evaluation has been overheard by the screenwriter himself and apologizes: "...right now I wish I could crawl in a hole and pull it in after me." She explains, "I just think that pictures should say a little something." One reason she rejected the script was because she recognized his name and thought he had some talent. The devastated writer replies: "That was last year. This year, I'm trying to earn a living." Joe leaves Sheldrake's office after he is turned down for a financial loan of three hundred bucks and drives to Schwab's Pharmacy [a re-created interior of Schwab's Drug Store where young, tight-sweatered Lana Turner was purportedly discovered], his "headquarters...kind of a combination office, Kaffee-klatsch, and waiting room. Waiting, waiting for the gravy train." He makes general SOS phone calls and other requests to everyone he can think of, but ends up empty-handed. As he turns onto Sunset Boulevard, his muses that his prospects add up to "exactly zero. Apparently, I just didn't have what it takes." He decides to "wrap up the whole Hollywood deal and go home" with a bus ticket back to Dayton, Ohio returning to a $35 a week job behind the copy desk of the Dayton Evening Post if it was still open - "back to the smirking delight of the whole office." enormous foreign built automobile - it must have burned up ten gallons to a mile. It had a 1932 license. I figured that's when the owners had moved out. And I also figured I couldn't go back to my apartment, now that those bloodhounds were onto me. The idea was to get to Artie Green's and stay there until I could make that bus for Ohio. Once back in Dayton, I'd drop the credit boys a picture postcard telling them where to pick up the jalopy. It was a great big white elephant of a place, the kind crazy movie people built in the crazy 20s. A neglected house gets an unhappy look. This one had it in spades. It was like that old woman in Great Expectations, that Miss Havisham in her rotting wedding dress and her torn veil taking it out on the world because she'd been given the go-by. As he considers his options, knowing that he can't return to his apartment where the "bloodhounds" will find him, he hears a woman wearing dark glasses behind a slatted shade call out: "You there! Why are you so late? Why have you kept me waiting so long?" He is summoned "in here" and waved/escorted into the gothic house by a bald-headed, properly-attired, white-gloved, German manservant/butler Max von Mayerling (Erich von Stroheim) at the metal-gated front-door. When he is mistaken as an undertaker by the ominous butler, Joe is told that he is not properly dressed for the occasion, but then cut off in mid-conversation and told to go upstairs where "Madame is waiting." While ascending the curving, black marble staircase, he stops short when told the grim, morbid truth by the devoted servant: "If you need help with the coffin, call me." In the upstairs corridor, he is summoned "this way" where he meets the wealthy, aging, reclusive Norma Desmond (Gloria Swanson), Paramount's greatest film star during the silent era, but now a relic forgotten for the past twenty years. She is dressed in black house pajamas, with a leopard-patterned scarf wrapped like a turban around her head. The butler and the woman of the house both mistakenly believe that he is the animal mortician who has come to provide a satin-lined coffin for the burial of her beloved pet monkey [a significant fact, for Joe's presence at the mansion leads to his own death] - positioned in her ornately-decorated bedroom on her massage table in front of a roaring fire: "He always liked fires and poking at them with a stick." She removes the shawl covering the dead monkey's body, and its lifeless, childlike hairy arm emerges and flops down. She bargains: "How much will it be? I warn you, don't give me a fancy price just because I'm rich." Norma (bristling): I am big. It's the pictures that got small. They're dead, they're finished! There was a time in this business when they had the eyes of the whole wide world. But that wasn't good enough for them. Oh, no. They had to have the ears of the world, too. So they opened their big mouths, and out came talk. Talk! Talk! Look at them in the front offices - the masterminds! They took the idols and smashed them. The Fairbanks and the Gilberts, the Valentinos! And who have we got now? Some nobodies. Joe doesn't want to take the blame: "Don't blame me. I'm not an executive. Just a writer." Norma criticizes Joe as a screenwriter as well as any others responsible for bringing words and sound to the movies: "You are. Writing words, words, more words! Well, you've made a rope of words and strangled this business. Ha, ha. But there's a microphone right there to catch the last gurgles, and Technicolor to photograph the red, swollen tongue." She orders him out. He sarcastically replies with a reference to Grauman's Chinese Theatre in Hollywood: "Next time, I'll bring my autograph album along, or maybe a hunk of cement and ask for your footprint." The last one I wrote was about Okies in the Dust Bowl. You'd never know because, when it reached the screen, the whole thing played on a torpedo boat. Norma: I think I'll have De Mille direct it...We've made a lot of pictures together. Joe: And you'll play Salome? Joe: Only asking. I didn't know you were planning a comeback. Norma: I hate that word. It's return - a return to the millions of people who have never forgiven me for deserting the screen. Norma: (recalling) Salome - what a woman! What a part! The princess in love with a Holy Man. She dances the Dance of the Seven Veils. He rejects her, so she demands his head on a golden tray, kissing his cold, dead lips. Joe: They'll love it in Pomona. Norma: They'll love it every place. Read it. Read the scene just before she has him killed. Joe: Never let another writer read your material. He may steal it. Norma: I'm not afraid. Read it! Sometimes it's interesting to see just how bad bad writing can be. This promised to go the limit. I wondered what a handwriting expert would make of that childish scrawl of hers...She sat coiled up like a watch spring, her cigarette clamped in a curious holder. I could sense her eyes on me from behind those dark glasses, defying me not to like what I read, or maybe begging me in her own proud way to like it. It meant so much to her. It sure was a cozy set-up. That bundle of raw nerves, and Max, and that dead monkey upstairs, and the wind wheezing through that organ once in a while. While reading the script, the real mortician "for comedy relief" arrives with a white baby casket for the dead monkey's funeral - "It was all done with great dignity. He must have been a very important chimp, the great grandson of King Kong, maybe." [The illusion to the Beauty killed the Beast theme is unmistakably obvious.] Feeling sick from the sweet champagne and the "tripe" he is reading ("that silly hodgepodge of melodramatic plots") by eleven that evening, he concocts his own plot. Destitute Joe sees a chance for easy money that he so desperately needs, even though he believes the script is unbearably terrible. He critiques the laughable script: "This is fascinating...What it needs is, uh, maybe a little more dialogue...it certainly could use a pair of shears and a blue pencil." But Norma objects to cutting it severely - "I will not have it butchered." He suggests an editing job to organize and improve it, and to provide a more contemporary slant, but Norma insists she must have someone she can trust, not just anybody. She asks him for his birthday and astrological sign - Sagittarius - and determines that he was born under a sign that she can trust. So Norma offers him the editing job, to help her patch up the screenplay on "Salome" that she has prepared for a comeback. Although desperate for a job, he explains cleverly that he is expensive and busy, but then decides to take the writing job and accepts her assignment. This is their first step toward mutual dependency. He feels self-congratulatory about the way he maneuvered himself into a job paying five hundred a week: "I felt kind of pleased with the way I'd handled the situation. I dropped the hook and she snapped at it."